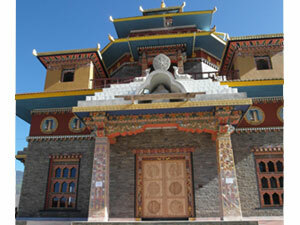 GRCA Member M/s Bhutan GRC won the contract for the construction of the GRC clad Golden Throne building based on prequalification, the project portfolio and their years of experience in the field of GRC Industry. 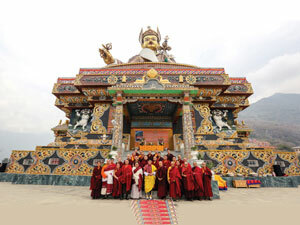 The client for the project was M/s Druk Odiyana Foundation, Bhutan, and the building was constructed to house the Guru Padmasambhava (Buddhist Saint) statue which at 154 ft (46.95 metres), is the world’s tallest and largest Guru Statue so far. The GRC clad exterior of the Sengthri (Golden Throne) building measured around 35 m x 30m on plan, and 12 m high, and all four elevations of the building included the same architectural features with mirror image patterns. 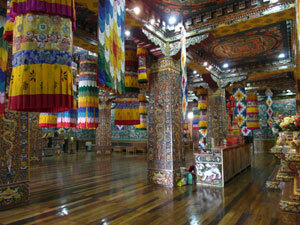 The internal Prayer Hall (Guru Lhakhang) was 26 m x 21 m overall and featured 20 large pillars (kachen) cladding with 4 four directional capitals (zhu) above. The Golden Throne has four main entrances of 8.60 m x 6.95 m overall size, each with 2 large pillars (kachen) cladding also with capitals (zhu) at the top. 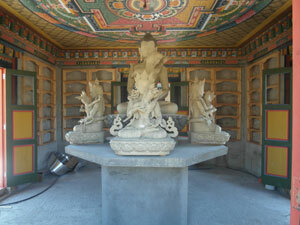 Creating the entire artwork and highly decorative and integrated pattern carving in accordance with the Buddhist norms, tradition and architectural theme, were the most difficult and challenging areas of the project. The entire GRC scope, artwork, design proportion and relevant norms were carried-out by M/s Bhutan GRC's in-house technical experts, professional and associated team. 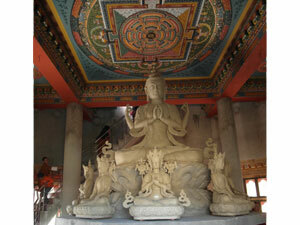 The main structure and civil work design was undertaken by M/s Civil-Park International of Bangkok, Thailand. The Golden Throne is the first religious project of this kind in Bhutan, therefore, to comply in line with the Bhutanese style, tradition and following religious norms and relevant historical features were the top most important and complicated part of the work in the project. The project took almost three years to complete due to the scope of the GRC and the complicated artwork, designs and carving works, and was completed in August 2015. 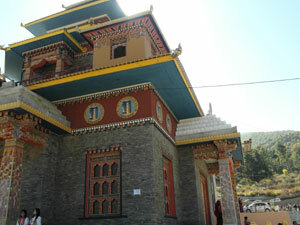 -	5-Star Resort for Druk Deothjung Pvt. Ltd.